Hessonite Garnet is the gem for Rahu, the North node of the moon. It is an invisible energy field where eclipses occur and is considered a secondary planetary influence. In this age of media, electronic devices and electromagnetic radiation, Rahu is very much affecting the world in general. It helps to balance the influences of media like television, it aids a sense of clarity, of knowing one's own mind, and general popularity in society. When weak or poorly placed, it causes strange reactions, imaginings, occult influences, fear, agitation, addictive behavior, drugs, lack of sense of self, lack of regard for society's norms or dissipation. Therefore, Hessonite Garnet, also known in ancient India as cinnabar, is obviously a very good gem to wear. This necklace is the least expensive manner I know of, for getting a sufficient supplementation for the Rahu influence when you have a weak Rahu in your chart. We appreciate our customers' understanding that flaws are expected in lower grade crystal based gemstones. The necklace is about 35 inches and contains 4 - 5mm chips of Hessonite Garnet strung on thread and weighs approximately 145 - 150 carats. Note: Some photos feature multiple necklaces, the $20 cost is for only ONE necklace. 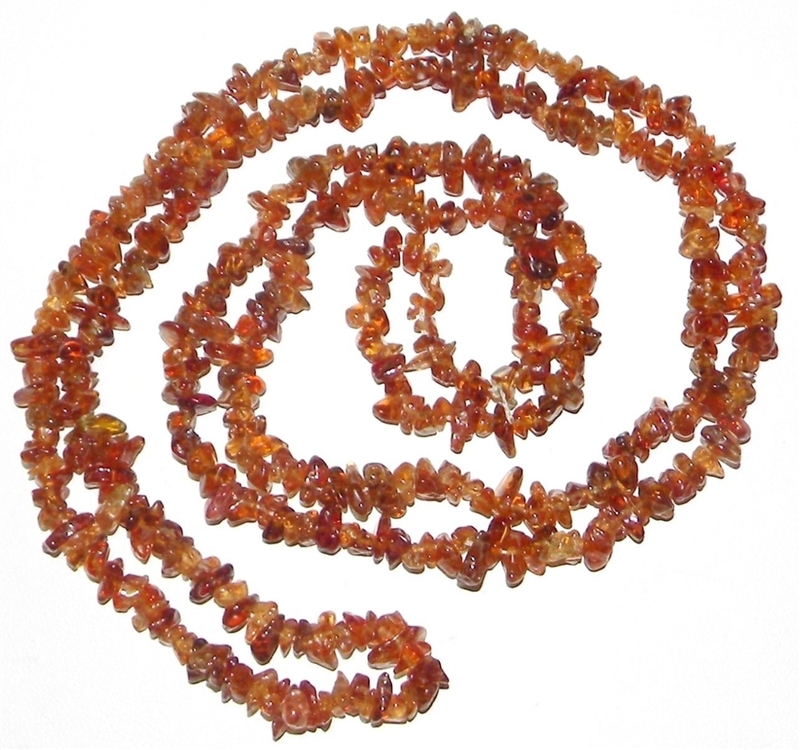 Length: about 35 inches on thread, contains 4 - 5mm chips of Hessonite Garnet, weight: approximately 145 - 150 carats.